The ending: "To be continued"
Water levels. Developers love putting them in games, and gamers hate playing through them. We%26rsquo;ve been pretty much locked in this perpetual dance with game companies since World 2-2 of Super Mario Bros. Boasting some of the most realistic water yet seen in a game, third-person shooter Hydrophobia seemed poised to change people%26rsquo;s minds about how fun gasping for air can be. Problem is, the water in Hydrophobia is just about the only thing this first installment of a planned downloadable trilogy has going for it. See, the water is gorgeous. It%26rsquo;s slick and fluid. It rolls off itself and gushes around to deluge a corridor when a door is opened. But unfortunately, everything else about Hydrophobia is, and please forgive us for saying this, watered down by comparison. You play as the aqua-averse Kate Wilson, a systems engineer aboard a colossal city-sized luxury boat. Kate unluckily becomes stranded in the ship%26rsquo;s bowels during a terrorist attack intended to keep the world%26rsquo;s population in check (long story - basically, they think the Earth has too many people). To escape, you%26rsquo;ll have to contend with the crazed terrorists and, yes, the rising water level. It%26rsquo;s an intriguing and promising premise. But almost every non-liquid element of the game, from the generic cover system to the too-typical firefights with enemies that are little more than walking and highly absorbent bullet-sponges, feels rushed and/or uninspired. It%26rsquo;s impossible to not notice how incredibly repetitive the game is. Any time you%26rsquo;re not simply wandering around looking for a key or computer terminal or some other random generic item you need to unlock a door, you%26rsquo;ll creep into a room, take cover, lean over, and blast away at anything that turns your reticule red. Rinse (and rinse and rinse) and repeat. True, various environmental kills intended to make the combat more seaworthy do look watertight at first. There are oodles of precariously placed exploding barrels, electrical wires, and highly flammable gas you can interact with in gruesome, baddie-slaughtering ways, and that%26rsquo;s without even mentioning the drown-ready water gushing in from everywhere. However, these elements don%26rsquo;t interact robustly enough and your weapon is lame. Thus combat seems, if you%26rsquo;ll forgive us once again, too shallow. It%26rsquo;s also arguably unfair. Even on the easiest difficulties, enemies can often spot you from across a gigantic room even if you didn%26rsquo;t make a sound, and subsequently start pelting you with bullets immediately. There are also smaller, nagging details that show how little polish the non-soggy elements of Hydrophobia have. For instance, the camera seems determined to give you an improper view of the action, especially in tight places like narrow hallways or elevator shafts. The other attempts to add depth ultimately come up short. Every 15 minutes you%26rsquo;ll come upon an encrypted door, and the only way to find the security code is by whipping out your MAVI (read: see-through Etch A Sketch able to X-ray everything in the world) and finding and then following the series of arrows literally etched into the walls in invisible ink. This is clumsily introduced early on in a puzzle that will sentence you to an immediate watery death if you%26rsquo;re unaware you can even use the MAVI underwater. You can, but the otherwise thorough ongoing tutorial neglects to mention it. Again %26ndash; lack of polish. That said, once you%26rsquo;ve gotten over this lack of guidance, those waterlogged moments are truly when Hydrophobia is at its strongest. When you%26rsquo;re swimming up an empty elevator shaft to navigate floor to floor, or hanging near the ceiling to catch your breath and then diving down and making a mad dash to the next room before your breath gives out, it%26rsquo;s exciting. Other elements, like the dull item-collection side quests that find you picking up presumably sopping wet journals and data logs off random desks, fail to ignite that same thrill. It%26rsquo;s also worth noting that even the water has problems. It%26rsquo;s realistic, except for when it isn%26rsquo;t: You can be swept underwater suddenly in a weak stream of knee-high water, and Kate swims with the lungs of an oyster-diver and the speed of a dolphin. This helps compensate for the fact that both diving deeper and rising to the surface with finesse just isn%26rsquo;t possible. From the game-stretching fetch quests to the clanking camera to the clumsy cliffhanger ending, Hydrophobia just doesn%26rsquo;t feel like a finished game. The water is truly unique and special, but everything else feels too much like a soggy, overblown tech demo. Hopefully, the second episode will still happen and will address some of these concerns. If it doesn%26rsquo;t, we%26rsquo;re afraid the water this series is most likely to remind gamers of will be the stuff that swirls out of sight when we flush the toilet. Description Run away from water, because it's trying to kill you. No more showers, kids. 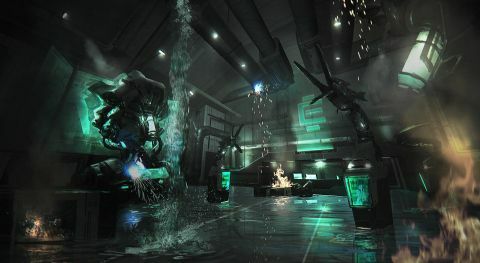 Especially after you play this survival-horror-puzzle-action ode to murderous H20.